In 2010, I gave myself until this year to make a decision about kitniyot. 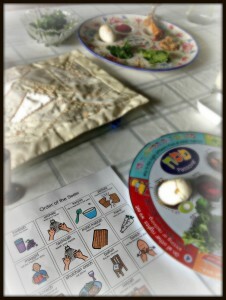 After several years of experimenting with the Pesach prohibitions, we have finally found what works best for our family. Corn and its byproducts? Fine. And while it is not what I would choose for myself, it is what works best for Ben. And isn’t that what parenting is all about? Putting the needs of our children ahead of our own? This was the first Pesach that made sense for us. It was full of joy. It was full of freedom. And now…we count our days to Sinai. To read more about our first inclusive seder, head over to The New Normal. When I attempted to click on “The New Normal” I found myself on a page for CamelBack products. What is the secret to getting to your other website. I like what I have read and want to read more! I had that problem too. It’s because I clicked in the link that was in the email, not on the link that was on this website. Here, here! I do kitniyot for my autistic daughter too, and guess what? If it’s absolutely, positively difficult for her, I let her have bread. I may not be following the letter of the tradition but I am following the spirit of it.